He is regarded as one of the most accomplished and complete midfielders in modern times. Seen as the successor to Pep Guardiola, he has trumped the legend when it comes to footballing achievements. 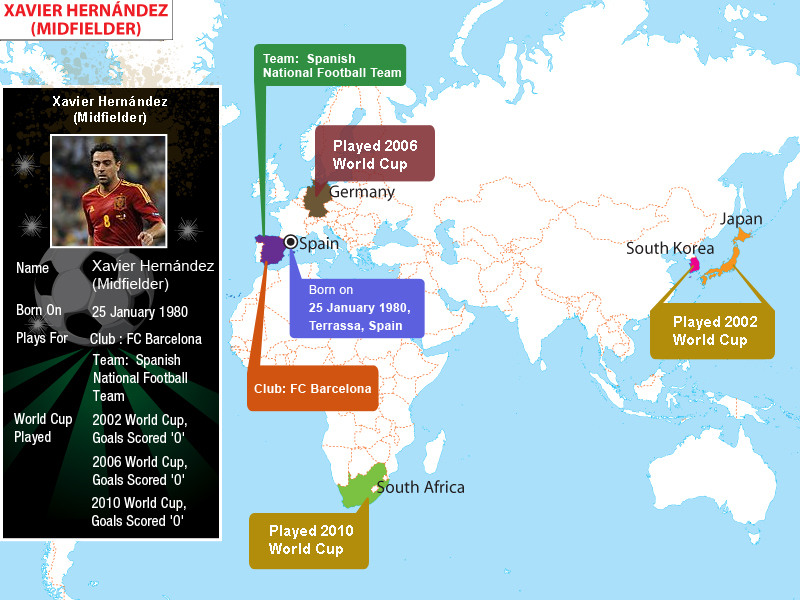 He has almost every prestigious trophy with Spain and Barcelona. Xavi is the engine which keeps Barcelona’s tiki taka game ticking.He is a master of passes and is also dubbed as the puppet master. He is constantly in search of space and compensates his lack of pace and strength with immense amount of ball control. Naysayers who said that Xavi has lost his X-factor were silenced with his superlative performance against Italy in the Euro 2012 finals where he provided 2 assists. Xavi, born in Terrassa, Barcelona, is a product of La Masia, the youth academy of Barcelona. Being one of the few one-club men in modern football, he has stayed loyal to his boyhood club. He broke into the first team in the 1998-99 season and was seen as the next Pep. His breakthrough year came in the 2002-03 season where he got 20 assists and 7 goals. He was an used substitute in the 2006-07 Champions league final, but he would later led the Spanish National team to success in Euro 2008, the 2010 World Cup, and Euro 2012, along with starring in the treble winning season for Barcelona in 2008-09 and helping them win the Champions league again in 2011. There is nothing that Xavi has not won in this beautiful game. He has won 7 La Liga titles, 3 Champions leagues, 2 Copa del Rey, the Silver Medal in the Sydney Olympics, 2 European Championships, and 2 FIFA Club World Cups, along with the 2010 FIFA World Cup. He was named in the European Championship team of the tournament in 2008 and 2012 and also in the FIFA World Cup best team in 2010.He has also been named the 3rd best player in the world in 2010, 2011 by the FIFA ballon D’or award. He also has this distinction of being the only player to provide an assist in the finals of 2 European Championship finals. He has been named in the FIFA and the UEFA teams of the year on 5 occasions each. He has the most official and overall (including friendlies) appearances for Barcelona with 653 and 833 appearances respectively. He also has the second most appearances for the Spanish National team with 130 appearances. He is married to Nuria Cullinera, a fashion journalist. The only blip in his otherwise untarnished career is the ligament injury he suffered in the 2005-06 season forcing him to be an unused substitute in the Champion's league final against Arsenal. He is rumoured to have differences with Spanish Manager Vicente Del Bosque over tactics. He consistently leads the number of passes completed during the match and the highest pass completion percentage. He is seen as an idol by many emerging midfielders such as Cesc Fabregas and Thiago Alcantara. He has also played for the Catalan National team.